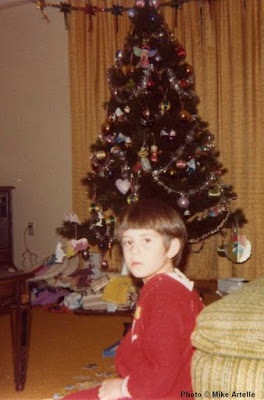 Me in my fuzzy red onesie pyjamas on Christmas morning, 1979. I was born on November 16th, 1973 in Ottawa, Ontario Canada, where I have lived my entire life. From boyhood and throughout my teens to my early 20's I grew up in a Catholic community and social environment in which I was taught that I should be ashamed to be gay, that my feelings were unnatural, and that homosexuality was sinful and immoral. But the most devastating aspect was the realization that I should hide how I truly feel inside and never express it to another human being, no matter how I might have felt about someone... or him about me. It was a matter of survival. The cruelty of it all apparently didn't matter to anyone. Homosexuals were treated like vermin, that's just the way the world was. This environment was in every sense of the word, abusive. No human being should have to endure that kind of social or personal degradation, which in truth is a form of brainwashing. It has taken my entire adult life until now, my early 40's, to undo all of that negative messaging. To convince myself that I no longer have to hide how I feel and that in fact, I have a right to just be myself. But most importantly, that I should stop hating myself, or stop hating the part of my soul that sighs with heartache at the sight of a handsome, beautiful guy. Sometimes I still have trouble with that, and just believing that the world has really, truly changed from how it was when I was a boy and a teenager. We don't get to pick where we're born, and I'm very fortunate to have been born to two very loving parents. I certainly don't blame them for the faults of society and the Catholic community. My folks always did their best to make sure that my siblings and I had a happy childhood, and for the most part we were all quite happy. But being a gay kid, growing up in a heterosexual world, there was always a part of me that wasn't happy because of how everyone around me made me feel about expressing my genuine self and just being gay. Back then, being gay just wasn't tolerated in my corner of the world, though my story isn't all that unique. It's the same one, more or less, that all gay kids went through back then and to my knowledge some are still going through it today. Thankfully however, today society has become considerably more accepting of homosexuals and homosexuality. Today, kids are encouraged to come out during their teenage years if they are already aware that they are gay. For that matter, even just talking about being gay isn't anything near as taboo as it once was, so there is no doubt that considerable progress has been made. Certainly, it's a lot easier to be gay in 2016 than it was just 20 years ago, but the situation is still far from perfect. There are still many aspects of society and popular culture that need improvement as it is still difficult to be a gay kid who must accept being gay in a heterosexist world. Being gay is perfectly normal, so ignore the negative nonsense! There are millions of people all over the globe, including boys just like you, who are gay. But you are the only you, so stand tall and be proud! You are a miracle!